The Fort Madison YMCA, located at 220 26th Street, will be managing the operations of the swimming pool this year. All swim lessons, passes, punch cards, pool rentals, etc. will be sold through the Fort Madison YMCA. Those who still have punch cards that were purchased in prior years may still use them. For any questions or inquiries, contact the Fort Madison YMCA at (319) 372-2403. The 2018 season will run from May 26 to August 12. The outdoor temperature must be 72 degrees by 12:00 noon in order for the pool to open. 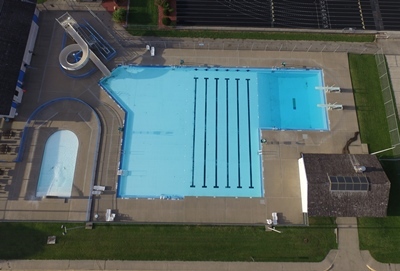 The pool will be open from noon to 1:00 pm for adult swim and 1:00 pm to 5:00 pm for open swim on Saturday, May 26th; Sunday, May 27th and Monday, May 28th (Memorial Day). From Tuesday, May 29th through Thursday, May 31st the pool will be open only for adult lap swim from 5:00 pm to 6:00 pm. On Friday, June 1st it will be open noon to 1:00 pm for adult lap swim and 1:00 pm to 5:00 pm for open swim. The pool will be closed on Saturday, June 2nd due to Fort Madison High School Graduation. The pool will resume swimming pool hours following the last official day of school. There are now additional adult lap swim and open swim times, in addition to the noon to 1:00 pm adult lap swim and 1:00 pm to 5:00 pm open swim. Go to "Pool Hours" for more information. Children 7 years of age and younger must be accompanied by an adult. The pool is available on Saturday and Sunday nights for rentals from 6:00 pm to 8:00 pm. The cost for a private pool party is $200.00 for the first 60 people and $2.00 per person over 60 people. You can reserve your pool party starting Tuesday, May 1, 2018 by calling (319) 372-2403.